Dissident Yoani Sanchez tweeted from Havana all through the night of Nov. 25. People stand in the street after nightclubs were closed by authorities following the announcement of Fidel Castro's death in Havana, Cuba, early Saturday, Nov. 26, 2016. The Cuban government has declared nine days of national mourning for the death of Fidel Castro, ending when his remains are interred on Dec. 4. With a shaking voice, Raul Castro, announced on state television that his brother died at 10:29 p.m. on Friday night, and that his remains would be incinerated Saturday. According to the governments's announcement, public activities and events will be canceled, and the Cuban flag will fly at half-mast. The Council of State says state radio and television "will maintain informative, patriotic and historic programming." Cuba’s government said the remains of Fidel Castro will be interred in the eastern city of Santiago that was key to his early life and his revolution. There will then be a mass gathering in Havana’s Plaza of the Revolution, where Castro often addressed huge crowds. His ashes will make a cross-country tour starting Wednesday from Havana to Santiago, retracing in reverse the route Castro took when the revolution triumphed in 1959. He’s to be interred in a Santiago cemetery on Dec. 4. Castro grew up near Santiago and attended school there as a youth. Dissidents received the news cautiously. All night activities were canceled in Havana and access to email and social media became difficult, as reported by Twitter users inside the island like Yoani Sánchez. Fidel Castro’s death had echoes across Latin America. The leftist government of El Salvador is expressed “eternal gratitude” to Castro and the Cuban people for help “in the most difficult times.” That’s apparently a reference to Cuba’s support of the guerrilla bands battling a U.S. -backed, military-dominated government in the 1980s. Cuban state television is carrying special programming celebrating the life of the deceased former leader. The programming includes footage from years past of Castro giving speeches on the revolutionary struggle. Castro stepped down from the presidency provisionally in 2006 due to a severe illness, and left office permanently two years later. He was succeeded by his younger brother Raul, who announced Fidel’s death on state TV. 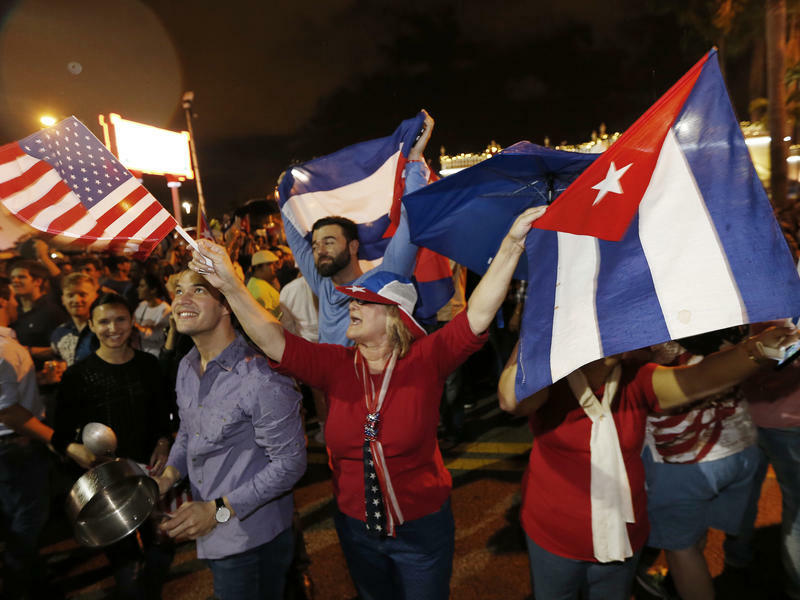 Within half an hour of the Cuban government’s official announcement that former President Fidel Castro had died, Miami’s Little Havana teemed with life – and cheers. Thousands of people banged pots, waved Cuban flags and whooped in jubilation on Calle Ocho, the heart of the Cuban exile community in Florida. Honking and strains of salsa music from car stereos echoed against stucco buildings, and fireworks lit up the humid night sky. Police blocked off streets leading to Cafe Versailles, the quintessential Cuban American hotspot where strong Cuban coffee was as common as harsh words about Fidel Castro. Castro has cast a shadow over Miami for decades, and in many ways, his policy and his power have shaped the city and its inhabitants, many of whom fled from his socialist rule. The nightly news had started as usual on Cuban state television when suddenly something changed. President Raul Castro appeared, seated before a desk in military uniform and delivered somber news: His brother Fidel Castro had died, nearly 58 years after leading a rebel army to a victory that led to one of the globe’s most durable socialist states. The president said his brother’s remains would be cremated on Saturday and news about tributes would follow. The death of Cuba’s Fidel Castro has caught many people in Havana by surprise in the wee hours of the morning. Mechanic Celestino Acosta was sitting on a porch in the capital’s central neighborhood of Vedado. This report was elaborated with information from the Associated Press.